I am working on a flying geese border and I made the corners round. My problem is that I have no clue how to sew the inside of the corner. If someone would please look at the picture and then explain to me how to sew the inside piece into the corner. I was not able to find this Flying Geese corner on the internet so I made my own paper piece pattern. If anyone would like the pattern I will be glad to send it on to you. Sewing curves is sometimes pretty difficult. The best way is to sew a stay-stitch line on the black fabric, and clip the curve seam. You would have to clip it a lot on this tight of a curve. Pin carefully and sew slowly. But if this were me, I would make a lining for the black piece and top-stitch it to the base. Good luck and please post finished piece for us!! If you go to youtube, there are lots of videos on sewing a curved seam. 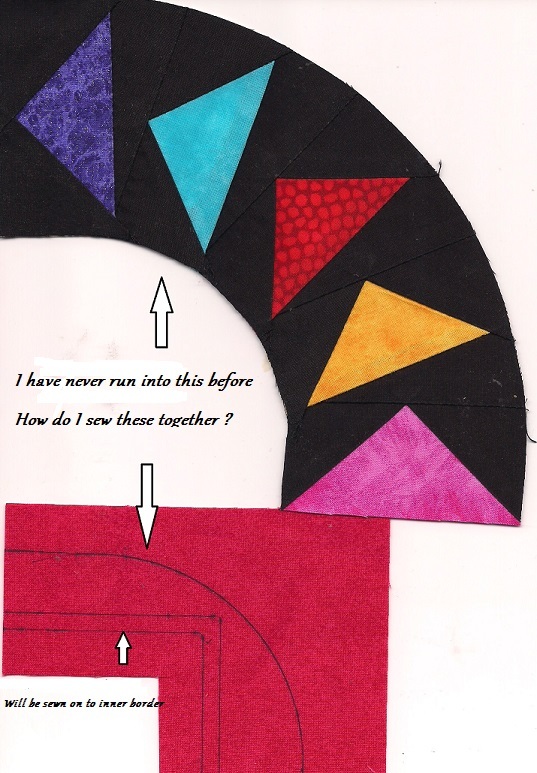 The problem I see is not the sewing so much as drafting the piece that you want to attach to your flying geese unit. If you look at drunkard's path templates you can see that the 2 curves are cut a lot differently from each other. I just check the YouTube tutorials. They all state to take it slow and easy. there is a tute in this forum on curved seams. I do drunkards path block and love to pin. I pin the center, the ends/edges and in between. then sew. some do clip a bit to release the inner curve. good luck. great flying geese! I think I see what you are asking. You can't sew the two together until you either make the quilt corners rounded to match up with the flying geese border (practice that unequal curve on scrap fabric first! ), or square up the flying geese to match the quilt. You could add black to the inner sides of the flying geese unit to make it square. If it's not a problem, that would add a few inches to the border width. I have made alot of wedding rings and other curved patterns and my DH years ago bought me the Curved foot for piecing and it works great; Just let the fabric follow the foot; its kinda like a groove for the fabric to follow. Hope this helps a bit. Basting under and then sewing does work also. Great! i'm glad you got them done. can't wait to see the finished product!!! Same here! I'd love to see it. I haven't tried curves yet. That's great! Can you show us how the corners turned out?